I went to the Wilson County Fair this year. Wilson Co is a neighboring county that is in transition from being a traditional rural county, to one with mixed heavy 'burb and rural. It is feeling some growning pains, but the Wilson County Fair is still true to form. There are all the contests like the best BBQ, best chili, best quilt, best photo, best basket, best garment, best honey, best produce, etc. There are the animals. 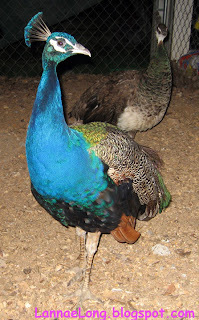 Look at the pretty peacock above! There is also one more thing... Fresh Corn Meal! 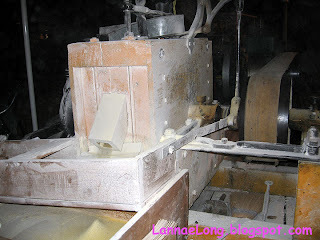 Here is the machine that grinds the dried corn and separates the corn hull from the inside. It was a great invention. 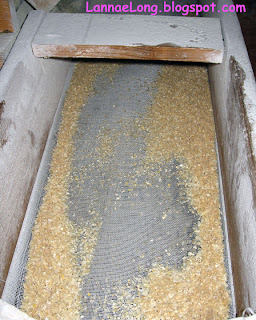 Inside the wood box is a stationary stone, and one rotating stone that breaks open each kernel and dumps the bits of hull and crushed corn into the hopper. The rotating stone is turned by the drive belt seen on the right of the photo The hopper separates the corn from the tough hull by sifting the small corn bits into a bagger, and the light fluffy hull stays on top. The guy Fred Corley, who was showing off his equipment, was saying that he rehab-ed his grandfathers equipment. He put a new wood casing on the grind stones, but the stones are the original real deal. He changed out the drive belt from being horse driven to being motor driven. Other than that, the equipment looks as it looked over 100 years ago. He happened to have found the equipment in his father's garage. Fred's father used it a long time ago, but it had not been running for years. Fred was having so much fun sharing his family history and his family's long time tradition of corn grinding. He was just beaming when he was showing us the equipment, and talking about each original cast iron part. Fred has been "bitten" by the old world traditions, and he loves the old way of getting corn meal, and he loves that it is his family's equipment that grinds the corn. I asked him if his kids are going to carry on with this equipment when he gets old. He said his kids are not interested right now. My wish for his family is that one day, when he is older and has grandkids of his own, one of his kids comes buy and sees the equipment in Fred's garage, and then follow the family tradition of ground corn. Listening to the guy was certainly the highlight of my trip to the Wilson County Fair! So, I bought 3 lbs of this golden product right out of the hopper. I have put it in my fridge as I want to be able to keep this stuff and cook with it all fall. I am home with my ground corn, and I want to do well with it. I have never had fresh ground corn before. What do I do with it? Anyone? Help! I am from first L.A. CA, then Boston, MA, 2 places with no tradition of ground corn. I want to learn the traditions of this ultimate local food! What is this called? Ground corn, corn meal, masa, polenta, grits? What can I make besides corn bread? Grits, polenta? Is that possible? Can I use this in corn pudding? Please help me! Thanks everyone! Every year I get to work in Sandusky/Huron Ohio during the same week as the Huron, OH Irish Festival. Last year was the 26 Annual Irish Festival, and this year was going to the 27th. There is the beer garden, fair food with corned beef, cabbage and potatoes, artists selling Irish themed items, vendors selling Irish themed goods, Irish themed music and Irish themed dancing. This has been going on long before I ever stepped foot in to Huron, OH, and I thought it was going to be a tradition to look forward to every year. This Irish Festival was held in the Huron, OH Boat Basin, which is lovely grassy amphitheater with the Huron Marina boat channel in the background. This year, to my dismay, the Irish Festival was 86ed for the Huron, OH 1st Annual BBQ Festival. My first thought was, what do this lily livered northerners know about BBQ? There is no tradition of BBQ in Northern Ohio, so the BBQ cannot possibly be good. I went for dinner , with great reservation, to the BBQ Festival. I mean, I live in Nashville, there is a tradition of slow cooked over wood and coal foods. There are plenty of BBQ pit joints in Nashville, and heading on to Memphis, there are even more! We dabble with our BBQ rig in the backyard, and we got it down to a 4 day process with preparing the meat, aging the meat, dry rubbing the meat and a couple of days on and off low smoldering wood coals. We never put BBQ sauce on our BBQ because sauce just destroys the natural smoky flavor developed over the long slow smoking time, and any delicate spice that might be in our dry rub. Sheesh, after 4 days of work, I will be hard pressed to destroy the flavor. So, I get to the 1st Annual Huron BBQ Festival, a bit mad that the Irish Festival was nixed, and not expecting much. There were 3 or 4 BBQ vendors, all of them are caterers in the area. None of the vendors are full-time BBQ pitmasters. The 1st vendor I went to had no line, and that should have been a tip off of what was to come. I am not going to mention any name, or show the product because it was so bad. The ribs were boiled first, then grilled and then smothered in a tomato based sauce that tasted like spaghetti-o red sauce. Spaghetti-o sauce good on spaghetti-os. These ribs were not even cooked on site, they were made somewhere else, and brought in vats of that nasty sauce. NOT good on ribs. NEXT! 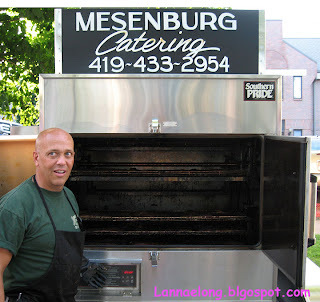 I went to the next vendor, Mesenburg's Catering. I watched them pull out racks of ribs from the smoker, chop them up, and then dump them into a giant vat of sauce. I cringed. I went up to the counter and asked for dry ribs. The girl looked at me and said I would have to talk to the boss. So I did. I asked him about his rig, and it is a new rig that he bought recently, and he has not been BBQing long. The rig is a wood and gas hybrid. Of course, being from Nashville, I "poo-pooed" the gas portion of the rig because real pitmasters would never heat their ribs with gas. 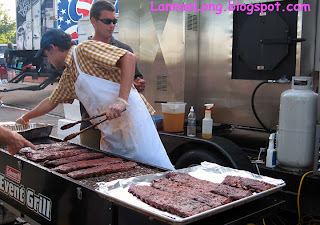 But, the guy was really nice, and I he pulled out a rack for me, and he chopped up ribs for me to taste dry. He added a nice rub with a nice crust. 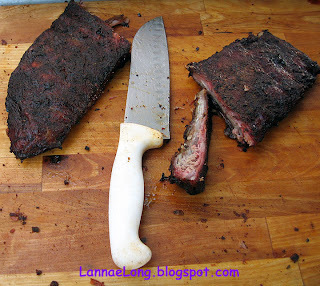 There was enough hickory wood in the hybrid smoker to add to the smoke ring and smoky flavor. I believe he said he smoked the ribs for at least 6 hours, and there was a smoky flavor. I give this guy a few more years to make these ribs, a few more years to not sauce his ribs, and I will expect to see him in Memphis for the World BBQ championships. 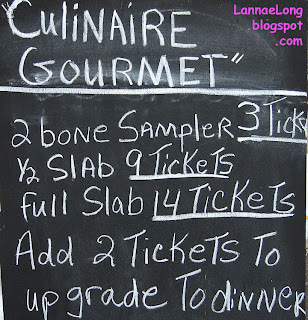 The third vendor I went to was the Culinaire Gourmet caterer. These people too are caterers, not BBQ pitmasters. They too have a hybrid wood and gas rig, about 3 times as large as Mesenburg's rig. They had a different way of serving their ribs, they put the ribs in the rig, sprayed apple juice on the ribs for moisture as well as sweetness. I don't think they let the ribs hang in the smoke too long, maybe for 2-4 hours. When they wanted to serve the ribs, they put them on a regular Kingsford charcoal grill to grill the ribs, not wood to heat the ribs up. I would call these ribs grilled ribs, not BBQ. They were better than I expected. They too then chopped up the grilled ribs, and dumped them into a vat of sauce. I did ask for the ribs dry before they dumped the ribs into sauce. I did like the sweetness the apple juice spray gave to the ribs. The festival was fun, but my heart and tastebuds are still with Tennessee BBQ joints. Tennessee Pitmasters, start your pits and get that wood to a low smolder, I will be coming visit. Eating locally while on travel may seem like a crazy idea to some, but it is doable. Sometimes "travel brain" says that McD's or fast food are a must to keep down costs, or for convenience. There maybe a lack of knowledge of what restaurants or local food sources are in the area. Believe me, one recent biz travel I had (heading towards Alabama), I went to McDs (1st time in 2007, and can I say I am still addicted to the fries) because we were in a rush, and it was the place we stopped off the highway. Luckily, most of my biz travel in the past 2 months has been to Sandusky, OH. I love Sandusky, I love the work I do there, and I love all the sources of local food I can get there. During all my trips there recently, I did not take a computer, all the local food sourcing was done by keeping my eyes open for real farm stands (not after market), speaking to the local co-workers, and by fliers, calendars and maps I found at the visitor's center located on Milan Rd. I also got a hotel room with a microwave, coffee maker (for hot water) and fridge, and a breakfast room with paper plates and plastic ware. I also brought with me a handful of quart sized freezer bags. With these three instruments and plastic tools, it is possible to eat locally, and cook in the room. I admit, most of my local food I ate was raw, but don't under estimate the power of the microwave and hot water. 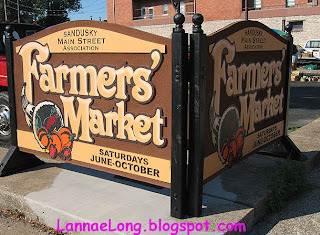 Sandusky, OH has a lot of small farmer farm stands and it also has a vibrant Farmers Market that has been around, in its current formation, for about 25 years. This market is open through the end of October, and has all the local, local organic, and fresh picked foods. If you find yourself in Sandusky during the summer and through the end of October, the Farmers Market is located on the corner of Hancock and Market, just east of the ferry dock is. It is quite spectacular to shop at this market because it is only located a couple blocks from the edge of Lake Erie, and it is a pleasant walk to the water. 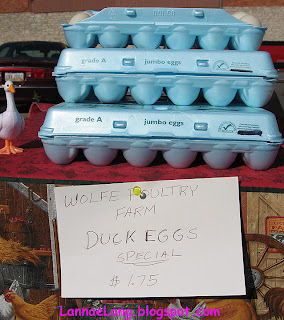 One farmer was selling eggs from his poultry including duck, chicken and goose eggs. It was not a "big goose egg" for me to shop at the market. Eggs are a great protein source, and can be cooked in the microwave. Scrambled is best, or else the yolk could explode. The best way is to scramble the eggs with a little milk, salt and pepper (taken from the breakfast room) and microwave, stirring every 30 sec - minute until done. Slice up a little local cheese on top, and you got a breakfast a-go-go. The other way to cook an egg in a hotel room is to put a whole egg, shell and all, into the coffee maker container, and make hot water and let the egg stand for about 15- 20 minutes in the hot water. At the market, there was a young woman farmer with a baby in a baby sling over her shoulder. This woman had medium length brown hair and a very nice smile. Her mother, her baby's grandma was there to. They set up there farm booth with their lovely flowers around the table, and her produce was displayed in lovely baskets. I forget her name, but she really reminded me of Nancy VanWinkle of Bramble Hill Farms from Nashville, TN. Nancy is one of the founders of my local Whites Creek Farmers Market. Nancy brought her wild flowers to sell, and she always had a lovely display of her produce. Nancy is a young woman with little kids that come with her. Sometimes Nancy has her baby in a baby sling, and the baby is sleeping away, undisturbed by the people asking the price of a tomato. While in Sandusky, it felt very homey to see people who seem so familiar to me, yet I have never met. 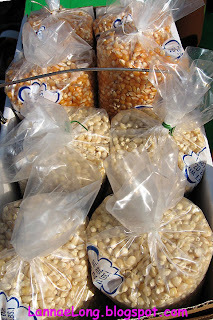 Another farmer selling produce, was selling locally grown popcorn in two varieties. It was great to learn about many varieties of corn that are produced for feed, human eating, popcorn and fuel. I was so lucky to come across the popcorn. The yellow popcorn has a thick skin, and pops up really big with a nice light yellow buttery color. The white popcorn is smaller, thin skinned and pops up white and smaller. I only bought the yellow kind, but I am kicking myself because I should have purchased both kinds, and all of the bags. My "travel brain" said minimize on purchases because you gotta carry this stuff around, so I only bought one bag. When I was in undergrad, out in Amherst, MA, the head of my department was Jefferson Koonce. Jeff was former air force pilot, Tulane and Univ of Illinois alum, and compassionate and excellent mentoring engineering professor. He also was a local farmer, and he grew mostly for himself and his family. Nearing graduation, Jeff and his wife has some of us over for dinner, and I noticed a bunch of dried corn cobs on his kitchen counter. He explained it was his popcorn, and his family loves to snack on the popcorn he grew. I asked how to cook up the popcorn, and Jeff said to put the kernels in a pan, or put the whole cob in a paper bag in the microwave. Jeff threw one of the cobs in a paper bag and into his microwave to let us try his popcorn. It was fantastic and fun. Thanks Jeff Koonce, I will always remember your farm and your popcorn. So, I admit, I do love eating popcorn. Never met a kernel I didn't like. During my eat local experiment, I had to put my jar of popcorn aside because I don't know where the corn came from. Well, so lucky me during my trip to Sandusky to have popcorn grown less than 20 miles from my hotel, I got to have a nightly snack of popcorn. I got a paper bag from the store (and used it every night) and tossed a handful of the kernels into the bag and microwaved those puppies up to a fluffy crunchy goodness. Yup, there was no di-ethyl mega-death stuff (like those pre-packed kinds) floating off my popcorn because it was all natural corn in a bag. Ah, the fluffy and crunchy goodness in my life again. Can travel snacking get any better than this? Besides eating Sandusky farmers market goodies, I went to the local dairy and bought my milk for all the days I was there. It tastes really good, and it is much cheaper than buying the industrial generic milk at the Safeway or Krogers. 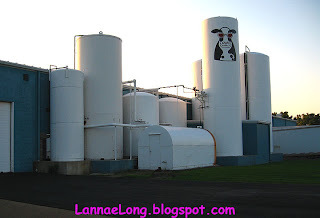 Gasoline cost to truck the milk as made milk prices rise, but not at this local dairy because all their milk comes from cows within 50 miles of this processing plant. This milk is so good, that I have been making it the only milk I drink when I am up in Sandusky. These trips to Sandusky were really stretching my creativity in eating locally. The fruits and veggies were so fresh, they beckoned to be eating raw. The eggs and milk were so fresh, that they beckoned to be eaten everyday. With Sandusky as my 1st "eat locally while on travel" experiment, I am certain that the next time I am on travel, I will plan on trying to incorporate local foods into my travel diet. I think though, the next trip will have to have some planning, like doing an internet search before I go. I have been in and out of Huron, Ohio for the past two months. It has been heaven when it comes to fresh fruit. Ohio did not suffer the bloom and deep freeze like we had in Tennessee, they were just freezing all the way through May. Ohio's growing season is still going strong. As I continue to try to eat locally, I ate all local fruit and milk while in Huron, OH. It was so worth it. These are my peaches I ate. These peaches came from a few peach trees from the woman's yard. She just set up this white table in her driveway to sell her peaches. I bought one container, and while doing so, I told her of the freeze and drought we had in Nashville. She took pity on me for my fruitless summer, and she gave me a 2nd container for free! 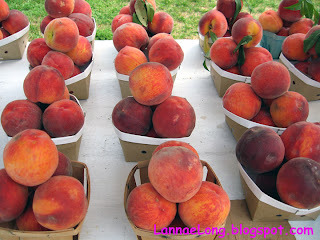 The peaches were as big as a softball, and they were so juicy that at every bite I had juice going down my arm, and dripping on my shirt. Oh, I just love these sweet peaches! Also, on the edge of town, there is a family farm that lets you pick your own raspberries, blackberries, and asparagus to name some of their crops. It was all on an honor system, they just had a jar sitting out with the price per pint or quart. Here is my container of raspberries. 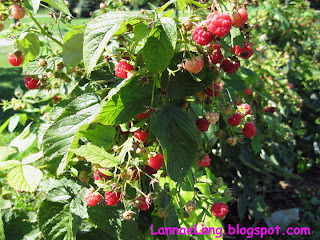 After picking raspberries, I now understand why they cost so much. There are very fine thorns on the leaves and stems that kept on poking my hands and fingers and made them itch a little. Also, there needs to be a gentle touch while picking each individual berry. This is all very time consuming. 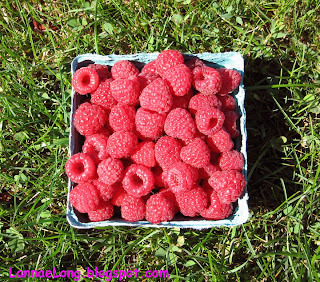 At any rate, my raspberries were so perfect and flavorful. I was really lucky to be able to catch the peaches and raspberries in season while I was in Ohio. The raspberry and peach blooms in the Nashville area froze during the deep April freeze. There were no accessible Nashville raspberries or peaches for me this year. I am so thankful for these trips to Ohio because I love fresh, ripe and juicy fruit so much! I just ate and ate and ate fruit for the weeks I was there. One last word about traveling, it is still possible to eat locally when on travel, you just gotta keep your eyes open for farmer's markets and people selling their own home grown fruits and veggies. The drought is finally over in Nashville, but it has come a little late as many crops have withered away. The two farmer's markets I was relying on for my produce, cheese and other foods had closed up shop a month ago due to lack of produce, drought and heat. 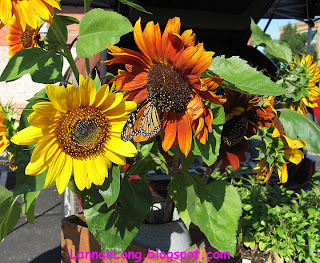 These markets began the growing season saying they would be open through October. I am at the mercy of a couple of the local farmers I have become chatty with, and I am now buying directly from them. It is a bit more work than the one-stop-shopping like I used to do at the Whites Creek Farmer's Market, but it is worth ever last minute for the fresh and organic foods. My Saturday starts by picking up what is fresh at the Hungry Gnome Farm on the North End of town. HGF is my favorite local farm because Alicia and Bert are honest organic farmers using their land well. They are still learning about crop quantities, and methods, and I think they are having fun figuring out the science of growing heirloom crops. 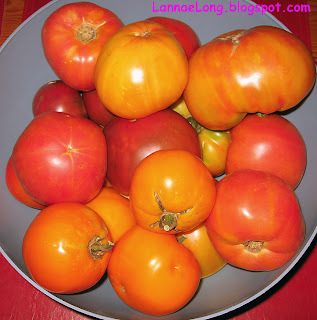 I picked up some heirloom tomatoes to make sauce to eat and to freeze for later, and to make ratatouille. 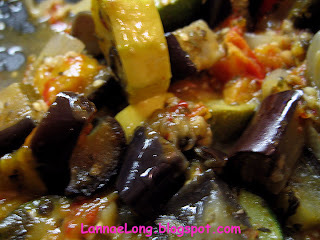 I did see the movie, and Matt printed the recipe that made the movie famous, so I really did have to go to my kitchen and make ratatouille. 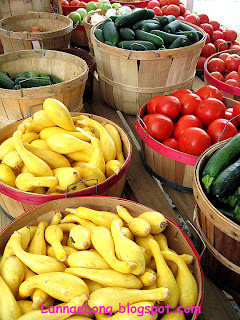 Then, on the way back to my house, I stopped by the Nashville Farmer's Market to see Smiley's for the rest of the veggies that go into ratatouille, and I picked up a couple baby eggplants, zucchini and yellow summer squash. Smiley, he keeps on smiling! The other day, I saw a sign for a new farm stand in the 12th Ave South neighborhood. This farm stand is on Halcyon between 10th and 12th Aves. So, as I left the farmer's market, I drove to the new farm stand. This farm stand is owned by a family that sells fresh beans from at the farmer's market, and they have other produce too like squash, zucchini, and tomatoes. Scott, a young man, the grandson of the farm owner, was sitting there by himself. He was friendly and hopeful people will buy his veggies. Since I already had my ratatouille veggies, I opted for 2 ears of Amish corn they were selling, and some fruit. I know it is late in the season for corn in TN, but I am just not ready to let go of summer. This little farm stand is so convenient to the 12th Ave South neighborhood, that I hope the residents support this little farm stand. The 12th Ave South neighborhood is easily walkable, and I hope to see the neighbors walking to get fresh produce from this farm stand, just like the old world way of doing things. I left the little farm stand, wishing Scott well and told him I would try to be back sometime in the next week or two. I hopped on over to a new pasta store, Lazzaroli shop, I heard about from another foodie in Nashville. Lazzaro, I met him twice, a couple years ago, once at a completely non-food context, and another during a meeting at a locally food specialty market. I was thrilled to be able to the possibilities of buying fresh pasta from another former Philadelphia guy, who knows what real pasta is all about, I took his card. Lazzzaro was only an email biz, and a personal delivery or pickup situation at that time. But, I never bought from him back then because, well, I am terrible with biz cards. I took it, and it got lost amongst other cards. I am thrilled he opened a shop, and I got to buy some pasta. 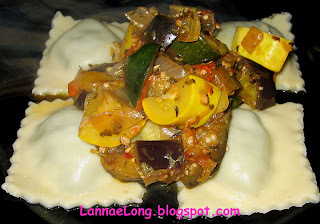 I opted for his spinach ravioli as I thought those would go with my ratatouille. Lazzaroil's has a bunch of other ravioli flavors like eggplant, pumpkin and cheese. 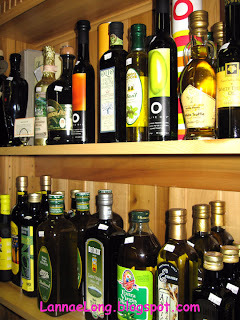 There is also fresh pasta that are noodles, and there is a big wall of oils. There are a limited amount of cheeses and Italian cured meats for now. I am sure the offerings will grow as the store matures. 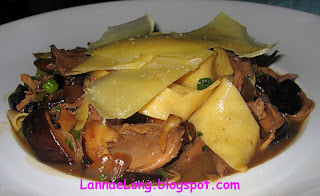 So, here is the recipe that made the movie famous, and the one I followed. The recipe was kind of more about a method rather than measuring, so it worked out well for me. 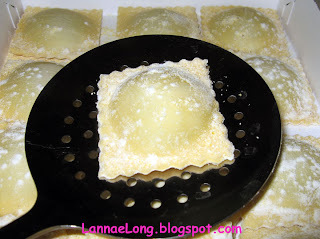 While the eggplant and tomatoes were doing their thing, I boiled up some water for the ravioli. During the 2nd 15 minutes of squash cooking, I added the spinach ravioli to the boiling water and cooked them for 15 minutes, as per Lazzaro's directions. So, my plate was made with all local veggies, spices and wine, and locally made ravioli. It was a good dinner. The cost of my dinner for 2 with enough leftovers for a 2nd meal? It cost us about $12, or $3 per serving. Why am I bring up cost? Well when I stopped by to pick up my goods at Hungry Gnome, Alicia asked me if I spend more on local and local organic foods? The reality is that my weekly household budget has remained the same and has decreased compared to big box produce shopping. The benefits over big box groceries are that I have better tasting and fresher foods, I know where my food comes from and has less of a chance of being tainted (poisoned) like China imported products, and I only buy what I can use, rather than having too much pre-packaged as they do at big box stores. As some people know, as long as I am living in the Nashville Metro area, and there are the means to go, I have the standing order that one of my birthday dinners must be at Margot Cafe. As all good stand orders are, I did finally get to go to Margot's. I did not get to go to Margot's on my birthday because the place was closed for vacation, so I had to wait for a couple of weeks. Some of you may notice that I have had quite a few celebrations for my birthday this month. Well, for about 15 years now, I have decided that celebrating my birthday month is way better than just one day, so every year since then, I have tried to keep celebrating my birthday for as long as I can! My life is funner and funnier that way. 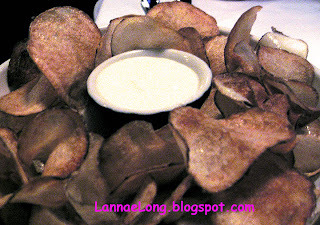 It was a mandatory thing to start my 3rd birthday dinner at Margot Cafe with the fresh fried chips with aioli. I have been waiting a year, since my last birthday, for these sinful little treats. I nearly ate about 3/4 of the huge bowl by myself. I love these things. I have been saving up my fried potato calories for this one single event. I have not had one McD's French fry all year because I was thinking of these chips. These fresh chips are so darn good. I am banking on going to Margot Cafe next year for one of my birthday dinners, so I need to save more fried potato calories for that time. 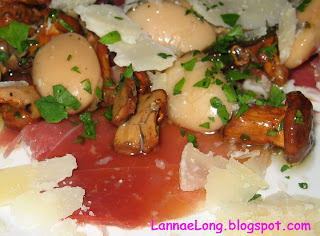 We split a starter and it was an antipasto plate with shaved parm, prosciutto, mushrooms, and gigunda beans. It was an Italian influenced plate that was high on flavor. It was a nice solid presentation of food. It was a simple dish from the standpoint of the consumer (me), but it is possible that there was some complex figuring on the chef side, while she decided to use the gigunda beans for the first time. This dish is akin to the iPod in complexity. The iPod is so darn simple for the consumer to use, but all the hidden things like the designing, developing and manufacturing of the iPod are quite complicated. For our entrees, I got a barramundi fillet with artichoke puree sauce, basmati rice and chick peas. Matt got a veal chop served with polenta croutons and ratatouille. I did not include a photo of the barramundi because everything on the plate was a bit beige to white, and it was a bit boring in the photo. Believe me, the fish and the rest of the dish was just fantastic and flavorful, and I did not want the glory of the dish to be eclipsed by a non-flattering photo. Matt's dinner was much prettier in the photograph. 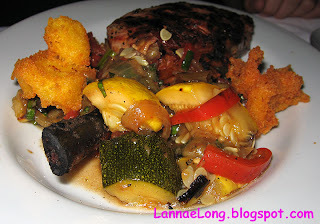 The ratatouille was delicious and the veal chop was straight forward and grilled quickly over a very hot flame. It is fun going into Margot Cafe to find out what is on the daily menu. For dessert, because I had to get dessert from Margot Cafe, we opted for the homemade blueberry pie. The pie had a real homemade flaky crust with just the right snap between my teeth. The open faced blueberries were not overly sugared, so the real blueberry taste could come through. There is nothing worse that an icky sweet pie. This blueberry pie, was not sweet, it was perfect, and the base ingredients were allowed to be their beautiful selves. This pie reminded me of my Great Aunt Isabelle's pies she used to make when I was young. Matt and I agreed that this pie was rather well done, and quite possible the best blueberry pie that we have eaten since the passing of my Great Aunt Isabelle. The last thing I want to say about Margot Cafe is that she has 2 of the best wait staff in Nashville, and they are Dana and Greg. There is an art to customer service, timing of dishes, watching for the clients needs, and being knowledgeable about the food and wine list. There is a skill and excellence that Greg and Dana provide that surpasses all others. The know the job, they are willing to do the job, they seem to want to do the job, and they have figured out the way to make the job profitable. They are pros and they do great job. We keep forgetting to request Greg or Dana to be out front line to customer service while making our reservations, but this time, because it was my birthday, Margot traded out tables for us so that we could have Greg. Thanks Margot! We like Greg, he is the best. UPDATE: CLOSED. Both chefs moved on to other ventures. Ombi, where have you been all my life? Seriously, I am glad I finally met you! The other day, two of my friends took me out for my birthday for dinner. They had already lavished me with gifts, and dinner was just going to be gravy, figuratively, and in a way, literally as well. One suggested Ombi, and I said, "Sure thing! I have been wanting to try this place for a long time!" As we approached Ombi, I was taken aback by how cool the place is to look at, and I was imagining how expensive it would be as the the entryway would suggest. To my surprise, as we were seated, the menu has more than 60% of the menu under $10, 25% of the menu under $20, and the few items (like rack of lamb) are under $28. Most of the menu is quite reasonable in price, but high on quality, uniqueness, preparation, and whimsy. All of the small plates, soup and salads are under $6, and include gravlax, pate, chicken livers with homemade tomato jam, fresh grilled sardines (what a treat! ), arugula salad, and grilled oysters on the 1/2 shell. Mixing and matching three of these, for example, one small plate, a bowl of soup and a salad, including tax, you are still under $20. Believe me, this is enough food to make me waddle out of Ombi stuffed and happy. I usually don't talk about price, but I was blown away at the fresh, local, and organic options that were offered with a reasonable price. For example a fois gras and beef burger large plate is only $15, but on the weekend late night it is only $7.50. To go with that burger and the rest of the menu are innovative libations made up by the bar manager. I did not partake in a mixed cocktail, but I think I need to do that because the saffron pearl onions and the maraschino cherries are made in house! Can you imagine having a Gibson having the aroma and flavor of a saffron onion? Cool! To start my birthday odyssey, we started off with three small plates of fun food to help us think about what we wanted for dinner. 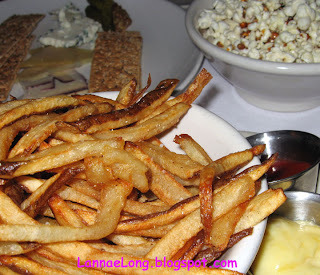 We started off with truffled popcorn, pommes frites, and an artisan cheese plate with dried apricots, spicy mustard and baby spicy gurkens. We just could not stop eating these treats. We were like game show contestants on the TV show Survivor on day 37 when faced with a food reward challenge and winning. It was cheese, fries and popcorn flying into our mouths, as if were ravenously starving. All we could say was, "This stuff is so good! OMG, I think I need to order 2 of these and take them home!" Not until each plate became depleted, did we come up for air and discuss what we wanted for our main meal. I decided to do a traditional soup and salad for dinner, as well as one friend taking in a salad for dinner, and the other friend opted for the duck confit special. I got a traditional French onion soup and applewood bacon sald with cheve and a red wine shallot vinaigrette. My salad was dressed perfectly, not to heavy, and it let the cheve and baby greens and arugula flavors come through. My onion soup was great because it was not overly salty! I generally do not get French onion soup because it has all that cheese, but it was my birthday dinner, and it was worth every last sip. I also dove into my friends duck confit dish too. I love shitakes and peas to begin with, and the duck was terrific. It is hard to find a good duck in Nashville. Laura, the chef did a great job with controlling the temperature while cooking the duck because it was soft, moist, and rich. Others in town have claimed to make a confit, but the others just made dry and stringy messes that were more about being quickly deep fried than slow cooked. Ombi's Chef Laura kept the temperature down over a long time, and the duck cooking in the fat never "boiled" and never released the moisture within it, leaving a smooth and melted in my mouth dish. I have to mention the room, which is lovely. There are three distinct areas, the bar, the dining room and the chef's bar. I think I would like to go back when Chef Laura is cooking, and sit at the chef's bar to watch. The architecture of the room is very much like what you might find in a slick Philadelphia restaurant, like Morimotos, and the room is really well done. I have one regret, and that is that I have not tried this place sooner. 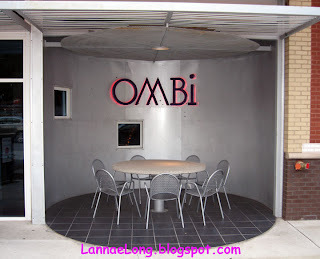 In the beginning, Ombi opened at night, while during the morning Le Peep was open in the same space. It was a strange thing to have a restaurant space do double duty. After a year or more of sharing the space, Le Peep is gone, and only Ombi remains. My former and pre-conceived notion about Ombi was that was just an extension of Le Peep. I really don't care for Le Peep because the food has really deteriorated down to skillet egg dishes that remind me of Bob Evan's breakfast skillets made with food service frozen cubed potatoes, cubed onions and peppers and waxy cheese, and some high school kid in the back putting no care in constructing the dish. Was I all wrong about Ombi, and I am so so happy to be set straight. I am sorry to have had such baseless thoughts about Ombi, and I am sorry it took me so long to try Ombi. Ombi is quite fantastic, and you better believe I will be back to bask in the food.